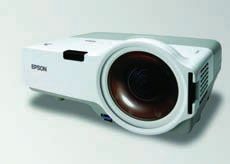 The Epson PowerLite Presenter portable projector and DVD player combo includes two 10-watt speakers with virtual surround sound, microphone support, and built-in closed-captioning capabilities. WXGA resolution displays content from wide-screen notebooks, and the unit supports a host of input devices, such as a camcorder, a digital camera, and an iPod. PROS: The USB plug-and-play connectivity makes for easy setup and eliminates toggling between projector and display. The controls are easy to use and well defined. The PowerLite Presenter projects in native 16:10 (WXGA) aspect ratio as well as 4:3 and 16:9 aspect ratios and offers USB connectivity for viewing JPG images without a computer. The built-in microphone is a nice feature. CONS: Cannot be mounted on a stationary mount. The 10-watt speakers may not be powerful enough for all locations. OVERALL EVALUATION: The variety of inputs and the clarity of the controls make this projector an excellent choice for anyone looking for a mobile projector in the mid-price range. The HD projection at an aspect ratio of 16:10 makes wide-screen viewing a real pleasure. Every school needs a couple of mobile projectors, and this one is designed for mobility.